When Pebble's app-enabled, Bluetooth-pairing, über-customizable smartwatch launched on Kickstarter last Spring, it became the most successful project in the history of crowdfunding — raising $10.2 million dollars in a little more than a month. Pebble's original pledge goal? $100,000. One year and 68,929 backers later, the wearable tech is "now ready for primetime," according to CEO Eric Migicovsky, who announced Pebble's exclusive retail partnership with Best Buy today. Although Kickstarter backers who ordered orange, gray, and white versions last year haven't received their watches yet, the Pebble ($150) in Jet Black will be sold at Best Buy online and retail starting Sunday, July 7 to meet the high demand. Kickstarter backers can change their orders from a colored watch to Jet Black at any time to expedite their shipment. 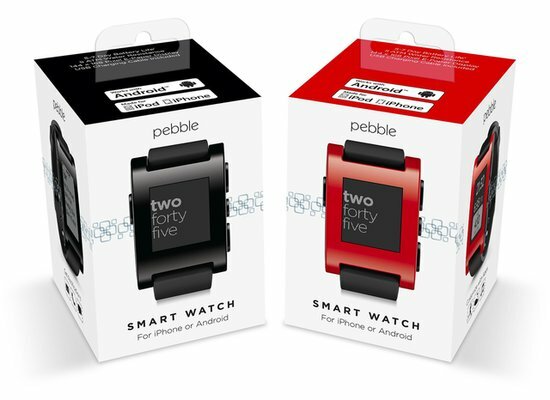 Cherry red Pebbles will be sold at Best Buy in August, and gray, orange, and arctic white versions will remain available for preorder at Pebble's website. The water-resistant watch uses Bluetooth to pair with iPhone and select Android smartphones. Pebble will vibrate when there's an incoming call, email, or text, and can show a preview of the message when available. Downloadable apps turn the Pebble into many different devices: a music controller, a running mileage tracker, a golf rangefinder, and more. Our favorite is the 7-Minute Workout, which we demoed in our ultimate gadget gift guide for dad. What do you think about the wearable tech trend? Would you want your smartphone notifications strapped to your wrist?